Did you know the Hartsfield–Jackson Atlanta International Airport is the world’s business airport? The airport receives more passenger traffic than any airport in the world. This airport is one of my favorite airports to connect through because there are some many restaurants and shops in each terminal. 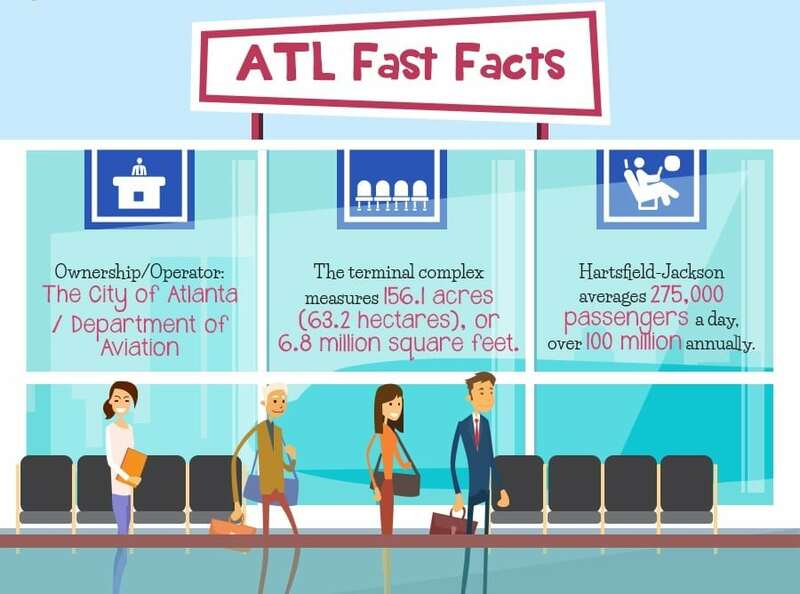 Here are some Atlanta Airport facts to remember the next time you fly through! The Hartsfield–Jackson Atlanta International Airport is located eight miles south of downtown Atlanta. You can take Atlanta public transportation for $2.50 from the airport terminal to various downtown locations. The airport is named after William B. Hartsfield and Maynard Jackson. Both are famous Georgian politicians. The ATL Airport is owned by the City of Atlanta and operated by the Department of Aviation. The terminal is 156.1 acres and includes six concourses. The airport also has the highest air traffic control tower in America. If you think the Atlanta Airport is always crowded, you are correct. 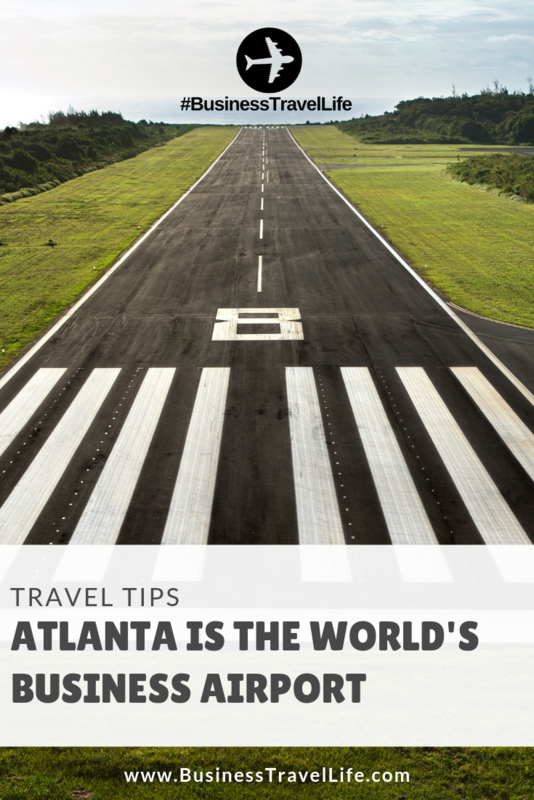 The Atlanta Airport averages 275,000 passengers per day and over 100 million annually. Within the six concourses, the ATL Airport has 207 gates. There are 167 domestic gates and 40 international gates. The airport serves more than 150 US destinations and 50 countries. 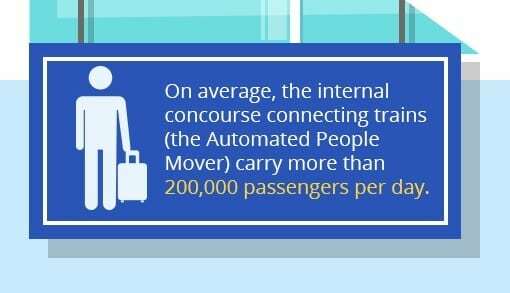 The Atlanta Airport has an underground train called the Automated People Mover that connects all concourses. There are four different trains that operate on a three mile loop track. You can expect to wait only two minutes (or less) for the next train to arrive. It is important to note that you walk between terminals (and I recommend it when time permits). The trains carry more than 200,000 passengers per day. If the Atlanta Airport is your home airport, you are likely aware of economic impact is has. The ATL Airport employees over 63,000 employees and generates 34.8 billion dollars annually for Metro Atlanta. One reason the Hartsfield-Jackson Airport in Atlanta may be so busy is that it is within a two-hour flight of 80% of the United States population. There are nearly 2,500 arrivals and departures each day. 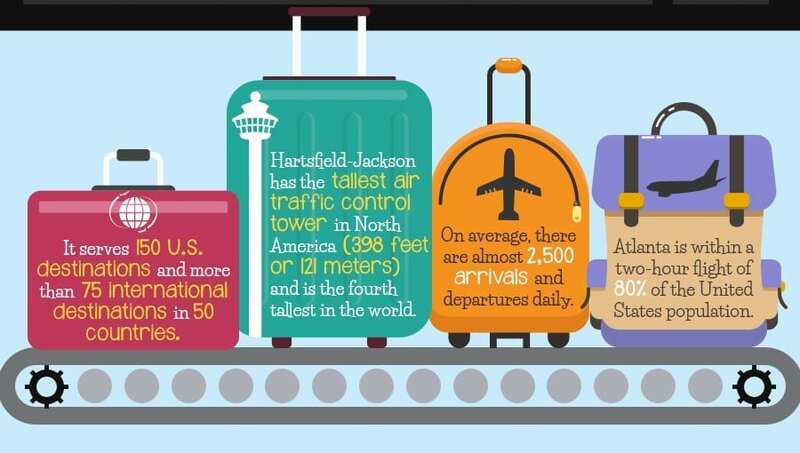 Thank you to storetraffic.com for sharing the World’s Busiest Airport Infographic with our readers!